Human activities generate wastes. Industrialization and population increment in most cities in Nigeria results in changing the composition and quality of waste generated as this can be seen in most cities of developing countries. Soil from waste dumpsites may contain heavy metals and naturally occurring radionuclides in significant amounts. Hazardous waste can cause and has caused pollution, damage to health and even death. The external radiation exposure pathways to the population have been extensively studied. , Several studies in Nigeria have measured the activity concentration of natural radionuclides in soil to ascertain the levels of contamination. ,,,,,, It was revealed that staple food stuffs consumed in Nigeria contain traces of radionuclide and as a result of this, refuse dumpsites were identified as a liable recipient in containment of radioactive materials as inhabitants cultivate and plant legumes, vegetables, and so on in the field around the dumpsites. The transportation of heavy metal as well as radionuclides in soil from this sites are possible via root-uptake and then to human through breathing and ingestion. Therefore, accurate measurement of elemental composition and radionuclide levels in soil sample from these dumpsites will provide information from which average radiation to the public from these dumpsites can be estimated. The aims of this study were to: (i) determine the activity concentrations of 226 Ra, 232 Th, and 40 K in the representative soil samples from industrial dumpsites; (ii) to estimate the absorbed dose rates and the effective dose from the exposure to the natural radionuclides; and (iii) to determine the heavy elements contained in the representative soil samples. This study was carried out in Ota, an industrial and commercial area located between latitude 6˚ 41' North and longitude 3˚ 14' East [Figure 1]. Its elevation is 74.259 m above the sea level and has a large concentration of land space with land mass of about 1460 sq km and has grown into an industrial city due to the economic development planning and lobbying by the Manufacturers Association of Nigeria which led to the official designation of Ota as an industrial town. Wastes in these dumpsites were mostly generated from industries such as pharmaceuticals, medical, breweries, beverages, aluminum roofing sheet, iron, and steel companies. The infectious medical wastes as well as the industrial toxic wastes are disposed together in the dumpsites. The study area is underlain by the Precambrian basement complex of South-Western Nigeria and is at the fringes of the border between Nigeria and the Republic of Benin. The analysis of radionuclide concentrations was performed by gamma-ray spectrometry with sodium iodide detectors. The counting assembly was a scintillation detector and a Canberra multichannel analyzer. The detector was a 7.6 × 7.6 cm 2 NaI (Tl) manufactured by Bicron. A cylindrical lead shield of approximately 5 cm thickness with a fixed bottom and a movable cover shielded the detector from background radiation. The spectrometer was tested for its linearity and then calibrated for energy using gamma sources supplied by the International Atomic Energy Agency, Vienna. 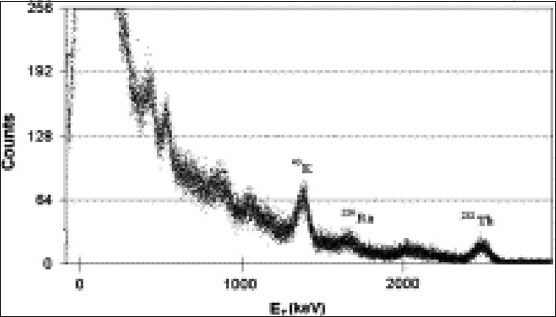 This was achieved by collection of spectra data from standard sources with energies in the range 0.511-2.62 MeV. The channel numbers of the photopeaks corresponding to the different gamma energies were recorded after 900s and the energy-channel linear relationship obtained is shown in [Figure 2]. The detection efficiency calibration of the system was carried out using a reference standard gamma source prepared by Rocketdyne Laboratories, Canoga Park, CA, USA, which is traceable to a mixed standard gamma source (ENV94084-200 g) by Analytic Inc., Atlanta, GA, USA. The values of efficiency obtained were 0.440, 0.321, and 0.141 for 40 K, 226 Ra, and 232 Th, respectively. 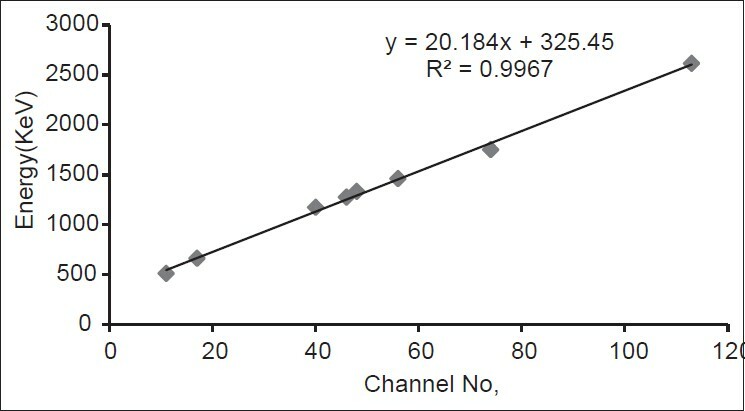 The efficiency calibration curve for the NaI (Tl) detector is shown in [Figure 3]. The detector assembly has a resolution of ~8% at 0.662 MeV of 137 Cs. The reference sources have activity concentration of 479.15, 566.47, and 11.60 Bqkg -1 for 40 K, 226 Ra, and 232 Th, respectively. The background count was determined by counting an empty container of the same dimensions as the one containing the samples and subtracting from the gross count. The counting time was set at 36 000 s (10 h) to obtain the gamma spectrum with good statistics. C is the activity concentration of the radionuclide in the sample given in Bq kg -1 , Cn is the count rate under the corresponding peak, ε is the detector efficiency at the specific g-ray energy, Pg is the absolute transition probability of the specific g-ray, and Ms is the mass of the sample (kg). Where LLD is the Lowest limit of detect, Cb is the net background count in the corresponding peak, tb is the background counting time (s), and f is the factor that converts cps (counts per second) to activity concentration (Bq kg -1 ). The DLs obtained were 17.3 Bq kg -1 , 4.2 Bq kg -1 , and 5.1 Bq kg -1 for 40 K, 226 Ra, and 232 Th, respectively. The concentration of 226 Ra was determined by a 1.764 MeV gamma ray from 214 Bi. 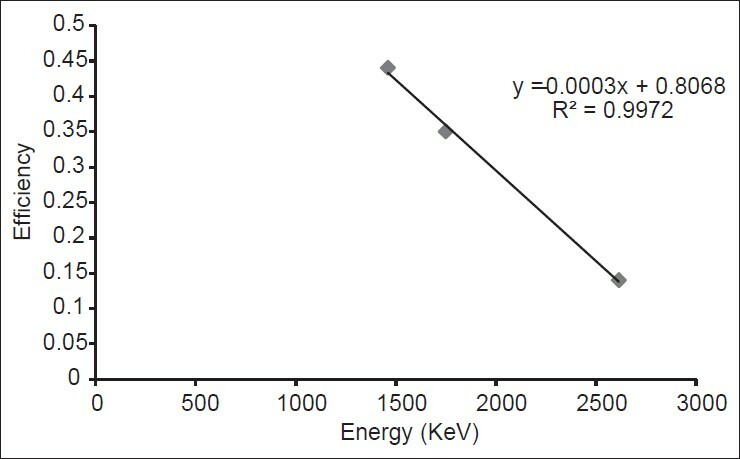 The gamma-ray energy of 2.614 MeV from 208Tl was used to determine the activity concentration of 232 Th and a gamma ray of 1.460 MeV from 40 K was used to determine the concentration of 40 K in the samples. 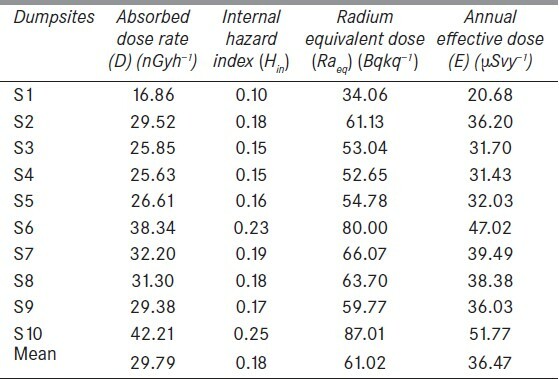 The absorbed dose rate, radium equivalent, internal hazard index, and annual effective dose calculated from the activity concentrations of the natural radionuclides in soil samples were presented in [Table 2]. The total absorbed rate in air (nGy h -1 ) at 1 m above the ground due to the activity concentration of 226 Ra, 232 Th, and 40 K was calculated using the formula. We assumed here that the contribution from other naturally occurring radionuclides and cosmic radiation at the locations were insignificant. Where D is the dose rate (nGy h -1 ) at 1 m above the ground due to 226 Ra, 232 Th, and 40K in the soil sample. ARa, ATh and AK are the activity concentrations of 226 Ra, 232 Th, and 40 K in Bqkg -1 , respectively. The value of LLD (4.2 Bkg -1 ) was used in the calculation of ARa since all the values obtained for 226 Ra in this study were below the DL. The internal hazard index ranged from 0.1-0.25 with a mean of <0.18 which is less than 1 as desirable. The results obtained in this study compared well with the similar investigation carried out in Botswana. The mean absorbed dose rate in this study (29.79 nGyh -1 ) is lower than the results obtained in Lagos  (56.40 nGyh -1 ) and in Portharcourt  (38.17 nGyh -1 ), Nigeria. The activity concentrations and the absorbed dose rate obtained in this study when compared with other studies from normal living areas in Abeokuta  (43, 84 and 329 Bqkg -1 ; 88 nGyh -1 ), Ibadan  (26, 54 and 619 Bqkg-1; 69 nGyh-1) for 238 U, 226 Th, 40 K and absorbed dose rate, respectively and Lagos  (absorbed dose rate = 41 nGyh -1 ), south-western Nigeria were found to be lower. All the results obtained in this study are lower than the world average given by United Nations Scientific Committee on the Effect of Atomic Radiation, 2000. 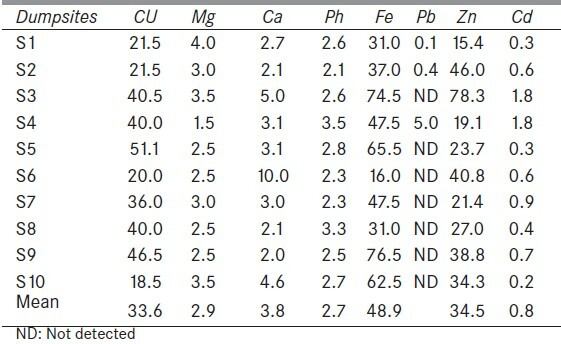 The concentrations of iron (Fe), copper (Cu), magnesium (Mg), calcium (Ca), phosphorus (Ph), lead (Pb), zinc (Zn), and cadmium (Cd) in soil samples from the 10 dumpsites survey were presented in [Table 3]. The mean concentrations of Fe, Zn, Mg are 33.6, 48.9 and 34.5 mg l -1 , respectively. These values are within the natural range of these metals in soil which is 15-250, 0.05-1.5, and 5.0-175, respectively. The mean concentrations of Cu and Cd are 33.6 and 0.8 mgl -1 , respectively in the soil sample. These values are higher than their natural range in the soil which is 0.035-0.400 and 0.01-0.7 mg/L, respectively. Pb was detected in only three of the 10 dumpsites and was higher in 2 of the dumpsites. Calcium and phosphorous were also detected in the soil samples and the concentrations of the two were below the natural range in the soil. Calcium had the highest value of concentration in parts per million out of the eight elements detected in the soil samples. This may be due to the primary and secondary mineral components in the soil of the area, which is essential for many plants functions. Calcium has not been considered as a major pollutant in the environment compared with other elements. The radionuclide content and heavy metal concentration of soil samples from 10 dumpsites in Ota Industrial city has been measured using gamma-ray spectrometry with NaI (Tl) detector and flame atomic absorption spectrophotometer. The average outdoor gamma radiation dose values obtained due to the activity concentrations of the radionuclides in the samples from these dumpsites are lower when compared with the results obtained for normal living areas in the same region. ,, However, no matter how small radiation exposure could be, it has effect on human being and exposure to this radiation must be reduced. The results of heavy metal concentrations in the soil showed the presence of heavy metals with cadmium and copper having concentrations above their natural range in the soil. At lower concentrations, these metals may be beneficial to the ecosystem but they are regarded to be toxic at higher concentrations. However, heavy metal are potentially toxic with prolonged exposure. Therefore, it is imperative to monitor their accumulation in soil samples before inhabitants can cultivate the land around the dumpsites for agricultural purposes to prevent the transportation of these metals into human system. The government should discourage the use of the soil/fields around these dumpsites for agricultural purposes because of the presence of heavy metals in the sites at present. 1. International Atomic Energy Agency. Radiation Safety. Regulation for the safe transport of radioactive material. IAEA Division of Public Information, IAEA-00725 IAEA/PI/A47E; 1996. 2. United Nations Scientific Committee on the Effect of Atomic Radiation, UNSCEAR, Sources and effects of ionizing radiation (without scientific annexes); 2000. p. 6. 3. Alaamer AS. Assessment of human exposures to natural sources of radiation in soil of Riyadh, Saudi Arabia. Turk J Eng Environ Sci 2008;32:229-34. 4. United Nations Industrial Development Organization, (UNIDO). Industrial Environmental Policy and Strategy for Ethiopia, 2001. Vol. 2. Addis Ababa: EPA/UNIDO. 5. Faweya EB, Babalola IA. Radiological safety assessment and occurrence of heavy metals in soil from designated waste dumpsites used for building and compositing in southwestern Nigeria. Arab J Sci Eng 2010;35:219-25. 6. Ramli AT, Hussein AW, Wood AK. Environmental 238U and 232Th concentration measurements in an area of high level natural background radiation at Palong, Johor, Malaysia. J Environ Radioact 2005;80:287-304. 7. Jibiri NN, Adewuyi GO. 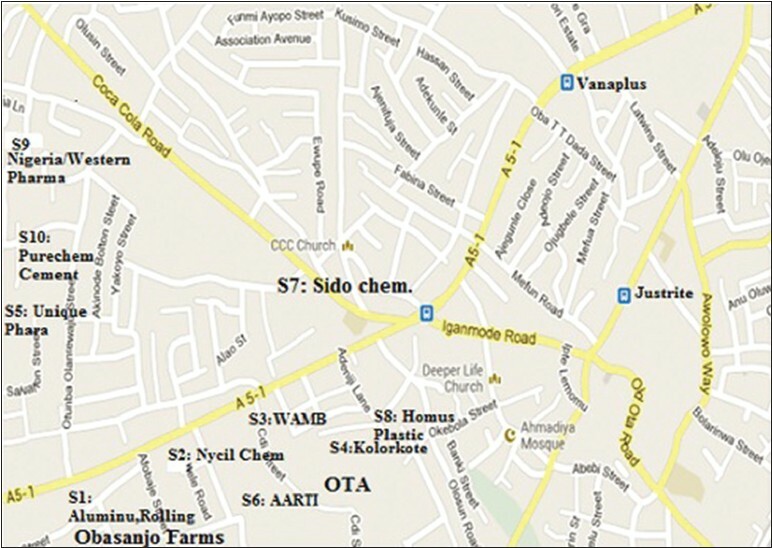 Radionuclide contents and physico-chemical characterization of solid waste and effluent samples of some selected industries in the city of Lagos, Nigeria. Radioprotection 2008;43:203-12. 8. Oresegun MO, Babalola AI. Occupational radiation exposure associated with milling of Th- U rich Sn ore in Nigeria. Health Phys 1990;58:213-5. 9. Obed RI, Farai IP, Jibiri NN. Population dose distribution due to soil radioactivity concentration levels in 18 cities across in Nigeria. J Radiol Prot 2005;25:305-12. 10. Jibiri NN, Farai IP. Assessment of dose rate and collective effective dose equivalent due to terrestrial gamma radiation in the city of Lagos, Nigeria. Radiat Prot Dosimetry 1998;76:191-4. 11. Jibiri NN, Esen NU. Radionuclide contents and radiological risk to the population due to raw materials and soil samples from the mining sites of quality ceramic and pottery industries in Akwa Ibom, Nigeria. Radioprotection 2011;46:75-87. 12. Farai IP, Obed RI, Jibiri NN. Soil radioactivity and incidence of cancer in Nigeria. J Environ Radioact 2006;90:29-36. 13. Ademola JA, Farai IP. Gamma activity and radiation dose in concrete building blocks used for construction of dwellings in Jos, Nigeria. Radiat Prot Dosimetry 2006;121:395-8. 14. Ademola AK, Obed RI. Gamma radioactivity levels and their corresponding external exposure of soil samples from Tantalite mining areas in Oke-Ogun, South-Western Nigeria. Radioprotection 2012;47:43-252. 15. EML Procedure Manual. In: Volchok, Herbert L, de Planque, Gail, editors. 26 th ed. New York: US Department of Energy, Environmental Measurement Laboratory; 1983. 16. Atomic Energy Regulatory Board. Accreditation of laboratories for measurement of radionuclide content in commodities. Mumbai: Atomic Energy Regulatory Board; 2003. 17. Veiga R, Sanches N, Anjos RM, Macario K, Bastos J, Iguateny M, et al. Measurement of natural radioactivity in Brazilian Beach sands. Radiat Meas 2006;41:189-96. 18. Berekta J, Mathew PJ. Natural radioactivity in Australian building materials, industrial waste and by-products. Health Phys 1985;48:87-95. 19. Yang YX, Wu XM, Jiang ZY, Wang WX, Lu JG, Lin J, et al. Radioactivity concentration in soil of the Xinzhuang Granite area, China. Appl Radiat Isot 2005;63:255-9. 20. Murty VR, Karunakara N. Natural radioactivity in the soil samples of Botswana. Radiat Meas 2008;43:1541-5. 21. Oladapo OO, Oni EA, Olawoyin AA, Akande OO, Tijani SA. Assessment of natural radionuclide level in wasteland soil around Olusosun dumpsite Lagos, Nigeria. J Appl Phys 2012;2:38-43. 22. Avwiri GO, Nte FU, Olanrewanju AI. Determination of radionuclide concentration of landfill at Eliozu, Portharcourt, River State. Scientia Africana 2001;10:46-57. 23. Ajayi OS, Ibikunle SB. Radioactivity of surface soil from Oyo state, South-western Nigeria. Int J Radiat Res 2013;11:271-8. 24. Okeyode IC, Rufai AA. Determination of elemental composition of soil samples from some selected dumpsites in Abeokuta, Ogun State, Nigeria, using Atomic Absorption Spectrophotometer. Int J Basic Appl Sci 2001;2:55-70. 25. Parth V, Murthy NN, Saxena PR. Assessment of heavy metal contamination in soil around hazardous waste disposal sites in Hyderabad city (India): Natural and anthropogenic implications. J Environ Res Manage 2011;2:27-34.